In 1998 the International Chess Federation (FIDE) decided to use electronic boards during the Chess Olympiad in Elista. 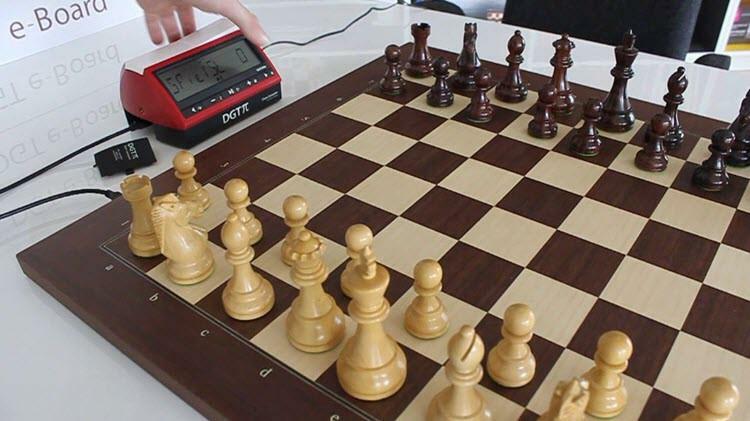 DGT company, which had already been renowned for creating digital game timers for the chess, responded to the request. Around 328 smoothly working e-Boards were up for the Olympiad. That’s when the chess world realized that the times when the chess games were published in print only after being played were gone. Thanks to the ubiquity of the Internet and the development of digital e-Boards, millions of chess lovers around the world were given the opportunity to follow the games in real-time. Today, it is hard to imagine international tournaments without streaming. Aside from tournaments, many individual players find e-boards very useful for their training. By having everything saved in their computers, they can easily backtrack to the main lines after complicated variations. Live streaming, however, comes with a price; on average, $600 per e-Board. So, for example, if tournament organizers decide to live stream 100 games, they will spend $60,000 only on electronic boards. Surely, the boards are reusable, but they are still considerably expensive. Needless to mention that e-Boards are a luxury expense for individual players and hard to justify. As an illustration that the issue is topical, below is an extract from the chess.com forum discussion where an average 1600 ELO-rated player describes the difficulties he/she is having during the training and why he/she may need an e-board. “Having come to the conclusion that trying to switch back and forwards from analyzing positions on a computer screen to a 'real' chess board is hindering rather than helping my chess I was thinking about getting a DGT electronic board. It’s a totally different perspective looking over a chessboard to staring at a 2D screen and I just find it difficult to adjust playing OTB (on the board). They are crazy expensive though, I don't know if I can justify £400 ($600) as an amateur player with a 1650 rating! The response? Most people surely agree that the DGT e-boards are helpful though the price is steep. New technologies are changing all the customary experiences the humanity have had so far. In chess, the biggest influencers are AI-based techniques and tools. The Optical Character Recognition (OCR) tool provides an unprecedented solution to the 3D board recognition problem. The solution has already become higher quality and a much more affordable way for chess digitalization. Chessify, a fast-growing IT company, has applied the OCR technology to develop its 3D recognition machine. It was successfully presented to the public during the annual IT product exhibition Digitec Expo 2017. While the performance wasn’t the best, the refinement of the product is currently in progress. If we can provide a $50 solution for the $600 problem, chess players will finally have access to the advantages of board digitalization in their training. And still, the main beneficiaries will be the tournament organizers, since they will be able to live stream all the games by spending much less than they do now. We, at Chessify, have developed a mobile app, which enables digitalization of chess boards from 2D platforms, such as books, journals, and from screens with our Android and iOS applications. It also allows analyzing chess positions with Stockfish, one of the strongest chess engines in the world. Over 250K chess enthusiasts already enjoy the benefits of the app and eagerly share their thoughts on the most effective ways to use the app.